The actor was arraigned on a charge of felony indecent assault and battery during a hearing in Nantucket District Court. The judge set another hearing for March 4. 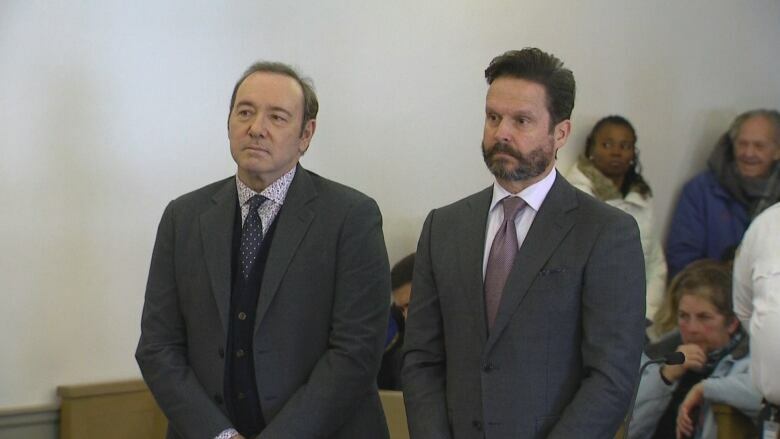 Spacey does not have to appear, the judge ruled, but said he needs to be available by phone. He had tried to avoid Monday’s session, arguing his presence would “amplify the negative publicity already generated” by the case. The judge granted a request by Spacey’s lawyers to preserve the victim’s cellphone data for six months after the alleged assault. Spacey’s lawyer, Alan Jackson, said there is data that is “likely exculpatory” for Spacey. The court appearance came more than a year after former Boston TV anchor Heather Unruh accused the former House of Cards star of sexually assaulting her son, then 18, in the crowded bar at the Club Car, where the youth worked as a busboy. Jackson has sought to poke holes in the case, noting that the teenager didn’t immediately report the allegations. “By reporting the sexual assault, my client is a determined and encouraging voice for those victims not yet ready to report being sexually assaulted,” said Mitchell Garabedian, who has represented hundreds of clergy sexual abuse victims. It’s the first criminal case brought against the 59-year-old actor since other allegations of sexual misconduct surfaced in 2017. After the charge was announced last month, Spacey released a video in the voice of Frank Underwood, his character on Netflix’s House of Cards, in which he said, “I’m certainly not going to pay the price for the thing I didn’t do.” It was unclear whether he was referring to the charge. He has also faced other allegations. In the first case, actor Anthony Rapp said Spacey climbed on top of him on a bed when Rapp was 14 and Spacey was 26. Spacey said he did not remember such an encounter, but apologized in the event the allegations were true. Rapp’s public comments led to a flurry of activity surrounding Spacey projects — he was replaced by Canadian legend Christopher Plummer in All the Money in the World, which had already been shot, and the Spacey film Billionaire Boys Club was buried in a limited release by its studio. Spacey won Oscars for best supporting actor in 1996 for The Usual Suspects and in 2000 for best actor in American Beauty.